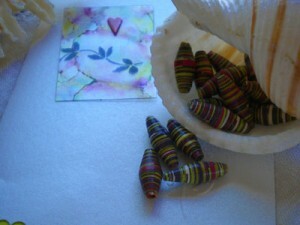 We have received more paper beads for the Paper Bead Trade from Hilde and Tina. 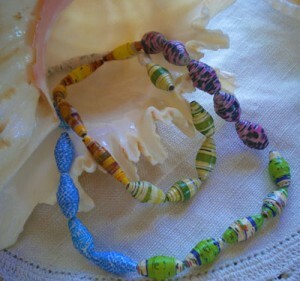 I know, that some of you is still in the process of mailing your beads, you will get your kit when I have received them. 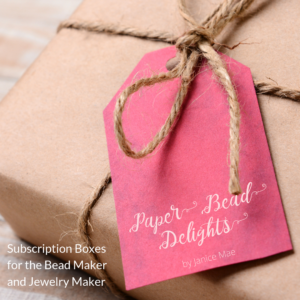 I promised those that were early in sending their beads that I will mail their kits out on the 15th 🙂 I had fun taking photos of Hilde and Tina’s paper beads today. 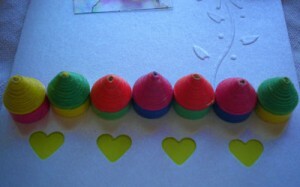 They remind me of crayons or colored pencil tips. These are more earthy tones. Hilde sent us a lovely card that I used as background in taking these pictures. These are tubes which she then wrapped with a contrasting color. 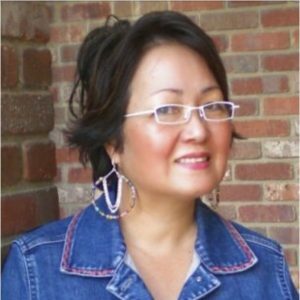 Last but not least is from Tina Craig. 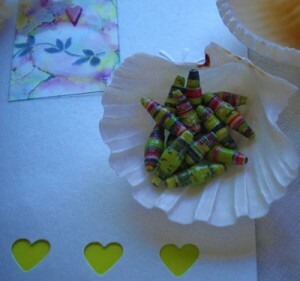 She strung different paper beads that she and her daughter made. 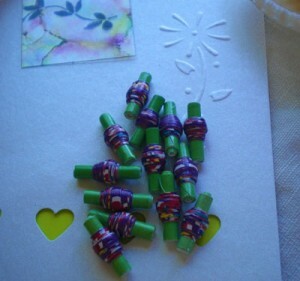 I especially love the blue from security envelopes and the speckled pink paper beads that look like pink animal print. 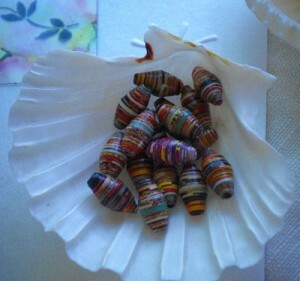 I think every ones paper beads came out fantastic! I can’t wait to work with them. I agree with Janice. Knowing that someone took the time to do make something for you by hand makes it beautiful. Also, they may be more lovely than you think. I love seeing other people’s work. I just get a kick from seeing the both the similarities and diversity among people’s work and it always inspires me. The thought that someone took the time to do it and it’s all hand made makes it beautiful. incredible !! lots of wonderful ideas once more !